No one thinks it’s a good idea to hike up electric bills—especially not to fund fracked gas imports. No one, that is, except Florida Power & Light (FPL)—the big power monopoly that just tried to dupe Floridians with its fake solar ballot measure. As the millions of voters who beat that measure know—FPL will stop at almost nothing to stunt the clean energy economy in the Sunshine State. 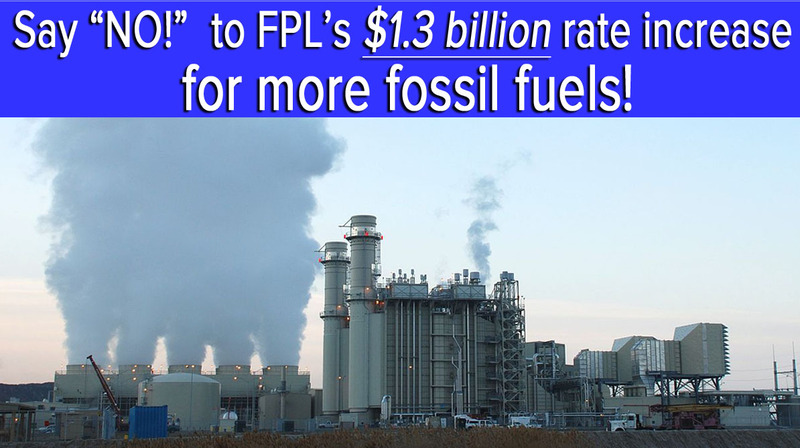 Now, FPL has pivoted to the Florida Public Service Commission with a request for customers to fund more than one billion dollars’ worth of new and expanded power plants that burn fracked gas from as far away as Pennsylvania and Texas. These power plants are unnecessary, as FPL has admitted homegrown solar and batteries could do at least as good a job of powering Floridian homes and businesses--at competitive prices. To make matters worse, FPL is also using these power plants to try to justify building unnecessary gas pipelines, such as Sabal Trail and Atlantic Sunrise. The commission actually has an easy decision to make on Nov. 29: It should vote against FPL’s request to charge customers for the unnecessary fracked gas power plants. The request is unlawful because FPL has flunked the test that Florida uses to decide whether power company expenses can be passed on to customers. As the commission has held, and the Florida Supreme Court has affirmed, that test is to minimize the cost of service by studying and then taking “every reasonably available prudent action.” FPL did not. Yet FPL never studied its clean options before moving forward with the unnecessary power plants. Indeed, FPL still “doesn’t know” whether it will delay yet another billion-dollar gas plant, in Okeechobee, and the company is asking customers to pay for that, too. 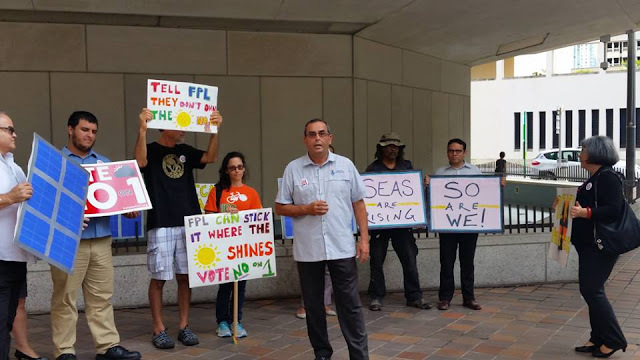 Call the PSC today at 1-800-342-3552 to let them know you oppose FPL's rate hike request for unnecessary gas plants! This letter was e-mailed to all active Sierra Club members who opt for receiving e-mails (contact membership@sierraclub.org to inquire about your account). We thought it was worth sharing and hope it will offer words of hope, strength and determination after the recent political election. There's no way right now to ease the shock and dismay of what we're facing today. Our movement had important wins last night, but those are overshadowed by the specter of a Trump presidency and a Congress still under the control of the fossil fuel industry. What we do now -- how we respond to this shocking turn of events -- will determine how catastrophic this will be for our environment and our communities. The very first thing we must do is make sure President Obama does everything he can over the next 71 days to protect our progress on climate action and environmental safeguards. Send an urgent message to President Obama right now urging him to take swift action before Donald Trump takes office. Sadness. Anger. Disgust. -- We're all feeling a complicated mix of emotions right now. We've fought hard over the last eight years to make real progress on climate, environmental protections, and so many important issues. And yet the forces that did everything they could to obstruct that progress are now in a position to take us backwards. Now the question is: what do we do next? Hope. Strength. Determination. -- We will fight and we will resist, but we will not cower in a defensive posture for the next four years. We've fought against long odds many times before -- and won. Remember that our Beyond Coal coalition defeated one coal plant proposal after another -- during the Bush presidency. And though Trump-McConnell-Ryan is a poisonous combination, they can't stop regulators and local governments from choosing clean energy when it's the cheapest and smartest option. They can't stop cities from going to 100-percent clean energy. They can't stop the private sector that wants to be part of the climate solution, not the problem. They can't stop millions of people from exploring and protecting our precious public lands. We'll have to adjust many of our strategies, but we won't allow our progress on climate and clean energy to be stopped. We can't afford to give up or waver from our conviction to fight for climate action and against corporate polluters. Take action right now to urge President Obama to do everything in his power to preserve key environmental protections. This is our moment to refuse to give up. Our resolve is not diminished by the momentary victory of cynicism over hope, hate over compassion, and lies over truth. We have no intention of standing down or succumbing to hopelessness. We can, we must, and we will win this fight. In the months and years ahead, we will redouble our campaign to fight the fossil fuel industry, and to make sure that our climate and communities are protected from corporate polluters. We will work with you make sure that dangerous fossil fuel projects continue to be challenged in courtrooms, town halls, and on the streets. What's clear is that cities, towns, and states will be the leaders on climate and environmental protection for now. Send an urgent message to President Obama to urge him to use the next 70 days taking decisive action to protect our environment. Go to www.sierraclub.org and look for ACT NOW on the right side of the home page to send your comments directly. P.S. To fight back, we'll need to build an even bigger movement. Forward this message to five of your friends and family and let them know how they can help protect our environment from Donald Trump and his polluter allies. Or spread the word on social media. A major effort is going on right now in Brevard County to get voters to pass a referendum, whose purpose is to begin major restoration to the Indian River Lagoon, 70 percent of which lies in Brevard County. Community volunteers, including many local Sierrans have been pounding the pavement, delivering leaflets door to door, waving signs, and tabling to inform residents of Brevard County the importance of passing the ½ cent sales tax to raise the funds needed over a ten year period to begin to seriously address clean up of the Indian River Lagoon. The project will be overseen by an oversight committee, selected by local members of the coalition and the county, using scientific criteria to oversee the progress of the work and make sure that taxpayers money goes towards the cleanup and restoration of the Lagoon and not towards other expense. The Brevard Indian River Lagoon Coalition was developed early in 2016. Leaders and representatives of lagoon/water advocacy groups and organizations around the county (and surrounding counties) gathered together to create a large-scale effort to save the Indian River Lagoon once and for all. Local Turtle Coast Group Sierra members were among the founding board members of the Brevard Indian River Lagoon Coalition, a 501c3 non-partisan group. As organizational efforts continued to develop, the fish kill of March 2016 was a clear call for immediate engagement in the community. The Coalition's first Call to Action event occurred on April 20th at FIT's Gleason Performing Arts Center, where nearly 500 people gathered to listen to experts and community voices and to learn about what was ailing our Lagoon. In the following months, the Coalition continued to organize and draw allies and strategic partners throughout the community to become a true force for education, advocacy, and change. Sierra Club is a major partner. The results of the planning was that on August 9, 2016, after an afternoon of passionate discussion, after presentation of the Save Our Lagoon Project Plan, Brevard County Commissioners Voted 5-0 to approve the ballot measure, and voted 5-0 in favor of a ½ cent sales tax in order to fund this restoration. Turtle Coast group gave $500 to the PAC created to get the word out to voters about the issue. The Florida Chapter donated $1000 to the PAC and encouraged members to match that. Florida Chapter and Turtle Coast Group are listed as Strategic Partners in this effort. Thank you Sierra Club for your support of Saving the Indian River Lagoon. 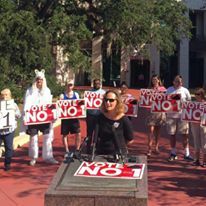 Vote No on anti-solar Amendment 1. In Ft. Myers, Gainesville, Hollywood, Pensacola, Miami, Orlando, Sarasota, and Tallahassee, the events were held at or near early voting locations. Others gathered at City Hall in St. Petersburg, Riverwalk in Tampa, a residential solar array in Titusville, and City Dock in West Palm Beach. The state’s newspapers, TV News and radio stations were all over it with over 20 media stories covering the protests, press conferences and rallies statewide. You can virtually join the crowd now; post this video on social media! “Communities across the country are replacing fossil fuels with solar power at an increasing pace; we can’t let Florida utilities deceive voters and hold back the promise of solar energy in the sunshine state,” said Michael Brune, executive director of the Sierra Club from the steps of St. Petersburg City Hall flanked by Pinellas County Commissioner Kenneth Welch, Mayor Rick Kriseman, city council members Karl Nurse, Darden Rice and and Lisa Wheeler-Brown and Tom Kimbis, National President of the Solar Energy Industries Association. See/listen here. Recently released recordings show Florida utilities using misleading information to promote the amendment -- and utilities have also already spent more than $2 million pushing the amendment, which would actually raise the price on solar power for homeowners and businesses and drive out the state’s burgeoning solar industry. “I'd like to see them take that $20 million and put it in a fund for low income people and elderly people to subsidize solar for them,” said Bishop Carroll R. Johnson, Jr., of Lifevision Church Orlando. The statewide rallies held this week show that Floridians are learning more about the deceptive amendment and won’t be tricked on Election Day. 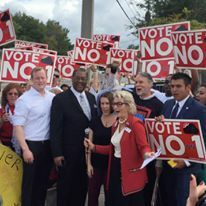 Other elected officials spoke in Gainesville, Miami, Hollywood, Tampa, and West Palm Beach and included State Representative Lori Berman, Alachua County Commissioner Ken Cornell, Broward County Commissioner Beam Furr, Miami-Dade County Commissioner Daniela Levine Cava, Palm Beach County Commissioner Paulette Burdock, and Tampa City Council Member Quido Maniscalco. Organizations and businesses participating in the statewide effort included: Sierra Club, The Tea Party Network, Florida Solar Energy Industry Association, League of Women Voters, SolarCity, ReThink Energy Florida, Solar Direct, Brilliant Harvest, U.S. Green Chamber of Commerce, Floridians for Solar Choice, First GREEN Bank, Citizens” Climate Lobby, The Energy Store, Space Coast Progressive Alliance, Organize Now, Infinite Energy, Inc., Audubon Society of Sarasota, Cutler Bay Solar Solutions, Florida Conservation Voters, Catalyst Miami, Women4Solar, Clean Renewable Energy Worldwide, Southern Alliance for Clean Energy, Lifevision Church Orlando, ESA Renewables, 15 Light Years, Solar Energy Industries Association, EarthSTEPS, Florida Council of Churches, The Florida Renewable Energy Association, Marine Resources Council, Solar Energy Systems of Brevard, Green Building Council Gulf Coast Chapter, Solar Impact, Vinyasun, American Institute of Architects Florida Chapter, For Our Future, and Earth Action, Inc. Check out even more photos and videos too here. Miami: Nov. 3 - Seas are rising! So are we! Titusville: Nov. 3 - Solar for Florida! In this tense election season, some of the important ballot measures happening in states and cities nationwide might not have made it onto your radar, but there are some important ones to watch. 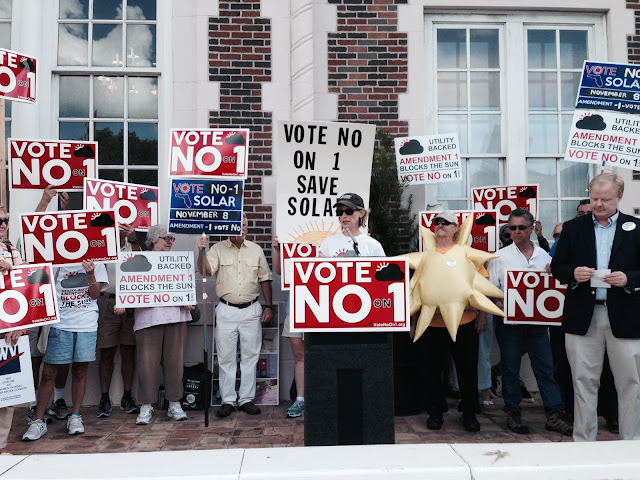 One of the biggest fights is taking place in Florida, where anti-solar utilities have proposed a very tricky and confusing measure called Amendment 1, which appears to be pro-solar but would actually make solar power more expensive and harder for average people to install on their homes or businesses. Florida’s utility companies are spending tens of millions of dollars backing this amendment, saying it’ll make solar more prevalent, but a huge and diverse coalition of groups -- from environmental organizations like the Sierra Club to consumer groups to solar-industry trade associations -- are calling the utilities' bluff. The Emmy–award winning climate series Years of Living Dangerously chronicled this drama in their season premiere on the National Geographic channel this week -- click here to watch a behind the scenes videoabout the Florida ballot fight. I’ve listened to the leaked recordings, and they’re jaw-dropping -- the expert essentially brags about how the utilities are using the overwhelming popularity of solar to trick people into voting for an anti-solar amendment to the state’s constitution. 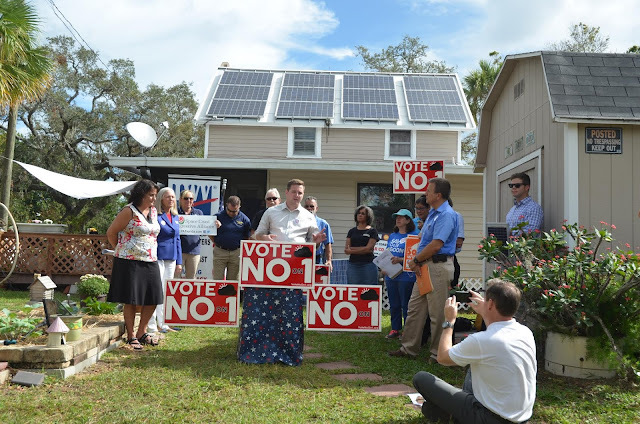 It’s true -- approval of Amendment 1 would make solar power more expensive, drive the solar industry away from Florida, and hurt consumers by denying them a cost-effective way to lower energy bills and take action on climate disruption. More than 50 small and large solar companies are fighting the amendment, saying it will allow these large monopoly utilities to limit customer-owned solar. The Miami Herald, Sun Sentinel, and numerous other newspapers around the state have called for a “no” vote -- with the Herald calling the amendment “a wolf in sheep’s clothing.” For more on all the unfolding drama and why this is such a bad deal, you can listen here to my recent interview about this tricky business on the United States of Solar podcast. 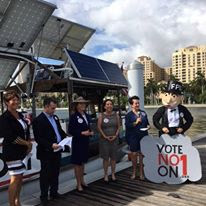 Floridians should vote no on Amendment 1 because it’s only good for the big utilities, which have poured more than $21 million into supporting it. Florida can and should be a leader in solar power -- don’t let the utilities draw the shades on solar power in the Sunshine State. Where: Early voting locations in Ft. Myers, Gainesville, Hollywood, Miami, Orlando, Pensacola, Sarasota, and Tallahassee. City Hall in St. Petersburg, Riverwalk in Tampa, a residential solar array in Titusville, and City Dock in West Palm Beach.